Our Performance results are posted online for our patient/family public access.The data posted on this sector reflects care provided to all patients. We are committed to improve the quality of care we provide to our patients/families. For example, Our Medical providers accept improvement through voluntary engagement in regards to performance measurement and improvement. We are continuously developing ways that help us improve the quality of health care and practice services offered. During this report, we are looking to at 3 Preventive Care Measures, for Chlamydia Screening, Influenza Vaccine, and Smoking Screening. Also, we are looking at Chronic or Acute Care Clinical Measures for A1C Control < 7, Cholesterol Screening, LDL Control High Risk and BP Control 140/90 as clinical outcome measures. Please feel free to contact us to discuss any matters of concern. The Denominator shows the Number of unique patients seen by the medical provider during the testing period. The Numerator shows the number of patients in the denominator who had one or more test results recorded. From 03/29/2014 to 06/29/2014 we ran reports in our EMR. Samples of the report are displayed in the table below.The report also shows the reporting period from 07/01/2014 to 09/30/2014, where we demonstrated small improvements for Chlamydia Screening, Influenza Vaccine and Smoking Screening. 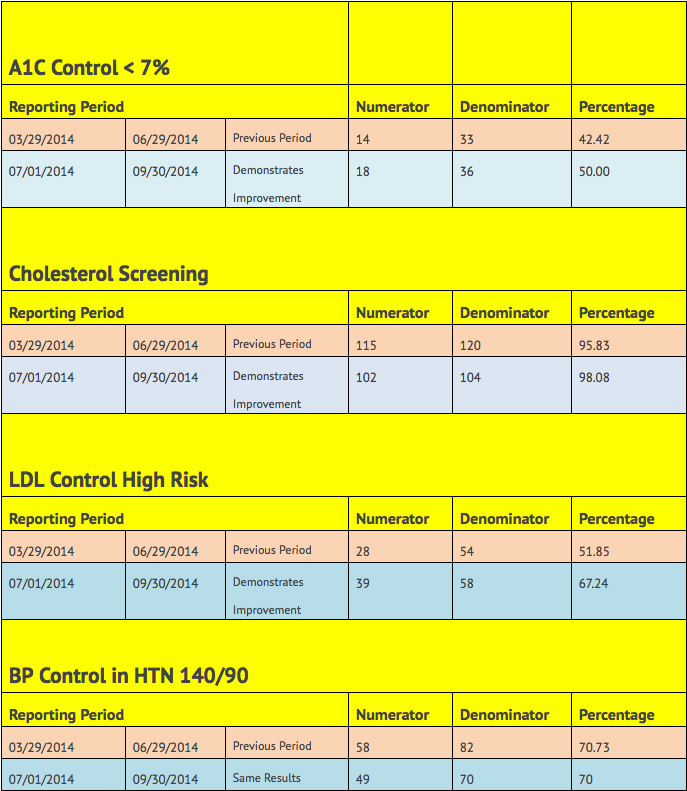 From 03/29/2014 to 06/29/2014 we ran reports in our EMR. Samples of the report are displayed in the table below.The report also shows the reporting period from 07/01/2014 to 09/30/2014, where we demonstrated improvements for BA1C Control and LDL Control High Risk. When an Asthmatic patient with a severe attack (Asthma with Exacerbation 493.92) comes to the clinic, the doctor will not to send the patient to the hospital. The doctor will treat the patient at the clinic. 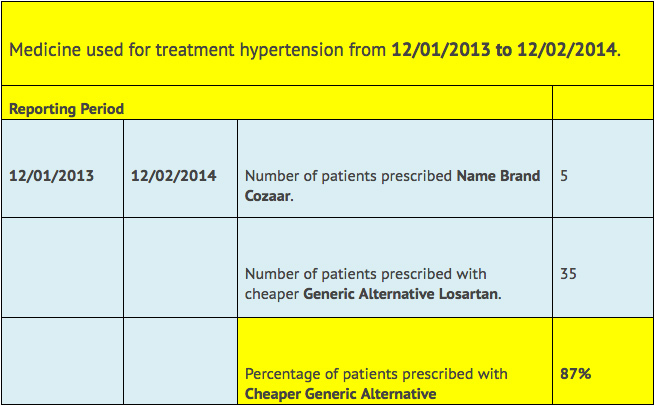 Prescribed medicine to treat HTN. 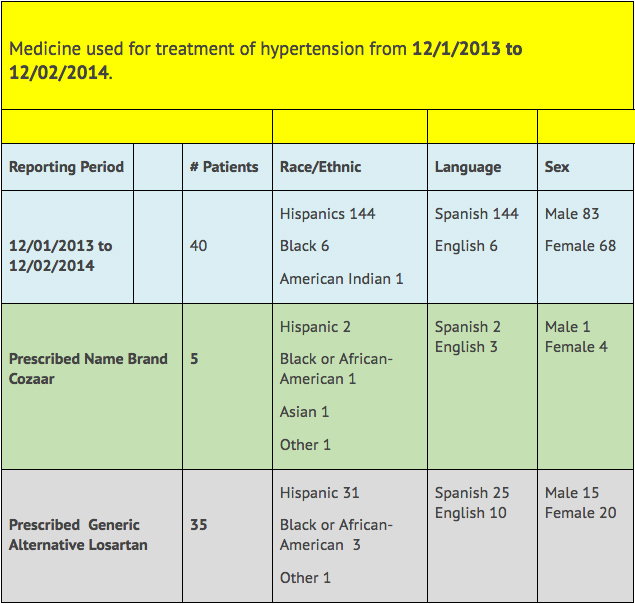 We identified that only 13% of the patients were prescribed with a name brand. 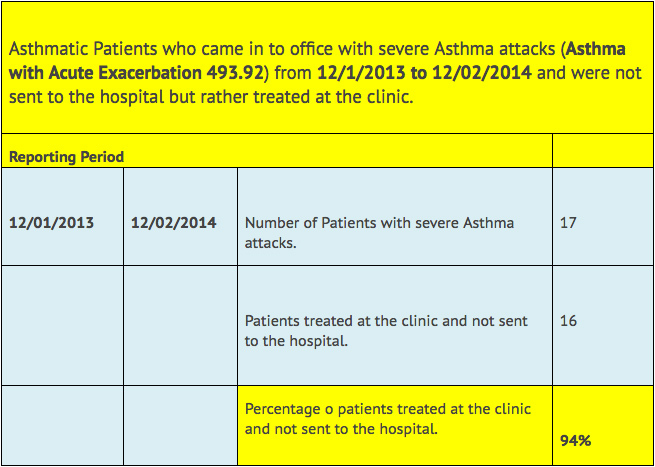 From 12/01/2013 to 12/02/2014 we ran reports in our EMR and found 17 patients with Asthma and Acute Exacerbation. Our data shows that rarely Females have a higher rate for Asthma attacks than males. 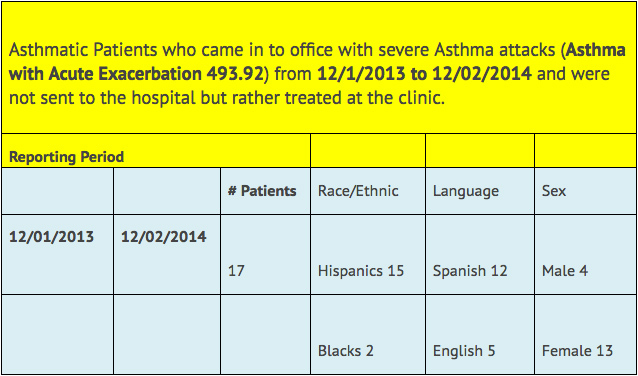 Hispanic Females in our communities have 50% more severe Asthma attacks than males, also all the females with Asthma and Acute Exacerbation are over 48 years old. That is 13 females in comparison to 4 Males. The Hispanic Community is a patriarchy culture where the expected duty of the female is to clean the home exposing them to dust and other Asthma triggers. We will need to pay a closer attention to Asthmatic females. Lifestyle behavior can worsen Asthma condition. We will need help Asthmatic females control dusting, reduce household allergens and pollutants, advise to use air cleaners, filters for air conditioners, and vacuum cleaners and if possible, avoid carpets and rugs. By reviewing all Asthma patients from 12/01/2013 to 12/02/2014, we found that all patients with no insurance have no RESPIRATORY ALLERGIC PANEL ordered for them. Patients with no insurance had 0% of RESPIRATORY ALLERGIC PANEL ordered. LABs have to be paid by parents out of pocket and we serve a poor community who also have to pay the visit and medications and often do not have the money. 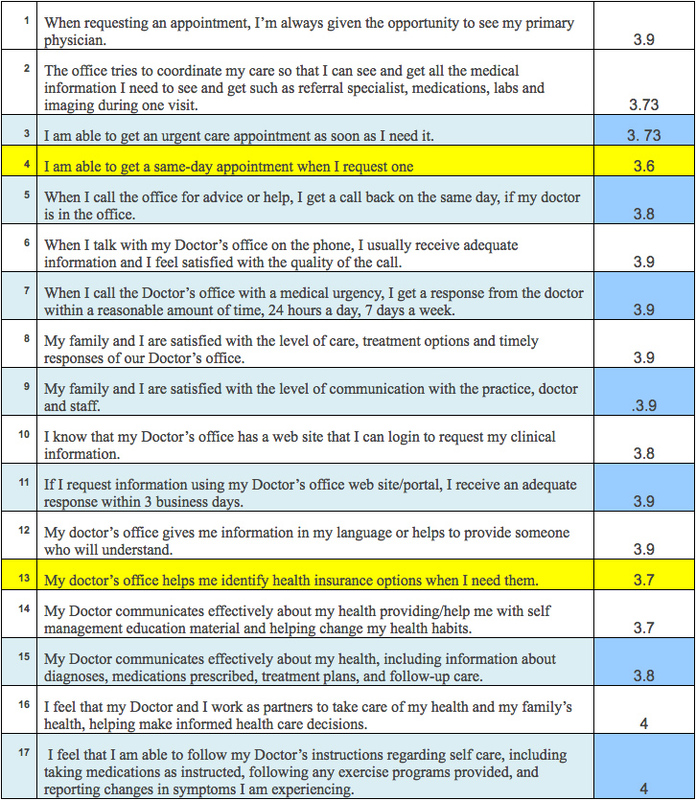 We randomly distributed a patient satisfaction survey to our patients in an attempt to identify problems areas. We are trying to establish the patient perception of access to care, quality of communication, patient confidence in the care we provide and the overall patient satisfaction. Overall the result look very good however in the area of scheduling, same date appointments and helping patient gather insurance information, we need to concentrate and make improvements.